The coldest time of the year is just around the corner, so we’re committed to rounding out our wardrobe with cozy (yet chic) finds. This means constantly keeping up a growing collection of cardigans, sweaters and coats that help Us stay bundled up in style. Luckily for our wallets, we don’t have to wait until Black Friday to take advantage of major savings on knitwear! When we spotted the Barefoot Dreams CozyChic Cardigan on sale, we knew we had to share the deal with you — trust Us, this is a markdown you can’t afford to miss. 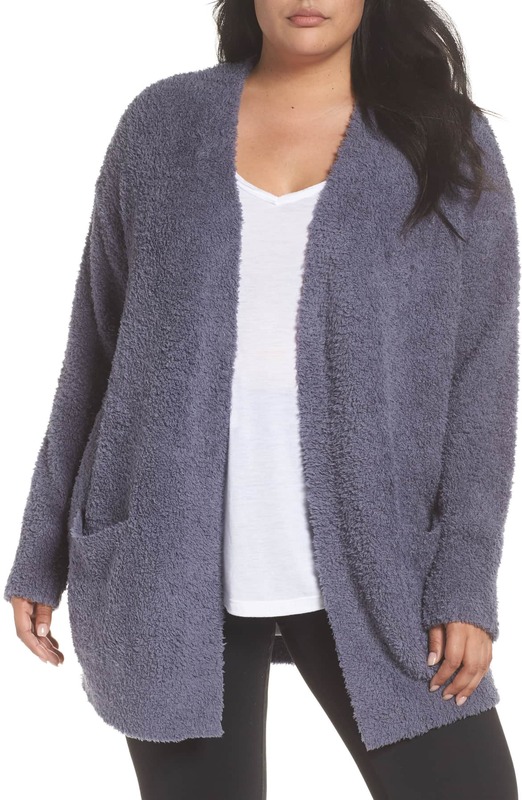 The oversized Barefoot Dreams CozyChic Cardigan had Us at hello and it is truly like wearing the biggest, sweetest bear hug! We saw it and had to have such a fuzzy warm outerwear piece. The design features an open front with large pockets for keeping our hands warm or holding our phone in a safe place. Now, the topper is an even better find since it finally hit the sale racks at Nordstrom. See it: Snag the Barefoot Dreams CozyChic Cardigan (marked down 50 percent off its original $134, now $67). Sold out of your size? Shop all CozyChic cardigans here. The cardigan is available in two size options: small/medium and large/extra large. 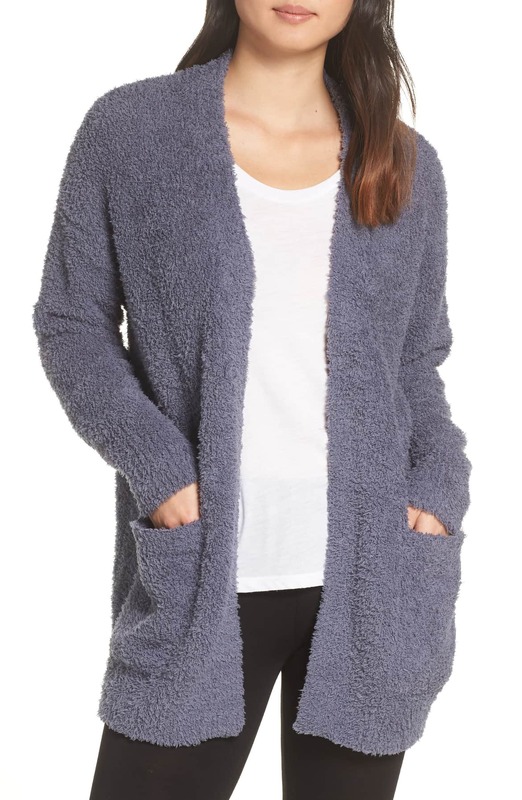 Shoppers who bought and wore this cuddly outerwear piece naturally rave most about how comfortable it is. They seem especially impressed by the thick fabric with many likening its feel to a being wrapped up in a blanket. Many reviewers shared they wear it in the house over their sleepwear but several noted they also incorporate it into their casual street style. People who wear the cardigan out love pairing it with jeans or leggings. Shoppers also shared that this cardigan made for the perfect birthday or early Christmas gift. We will be wearing the Beach Rock (beige) cardigan with a long sleeve top, dark blue jeans and sneaker wedge booties in a similar beige shade. As much as we adore the versatile beige shade, the fuzzy knit is also available in this lovely Deep Sea Blue shade. This cardigan will look great with a crewneck cashmere sweater, our go-to favorite leggings in black and the gray version of the Tory Burch sneakers we found on sale! We could also layer the beauty on top of sweater dresses and step out wearing stockings and over-the-knee boots. On another day, the topper can be worn with a long sleeve T-shirt, faux suede leggings and oxfords and a cross-body bag for a vintage-inspired ensemble. We love that the Deep Sea Blue shade is available in regular sizes but also comes in two plus size options. We can scoop up the 2X and 3X and they are flying off of the racks! 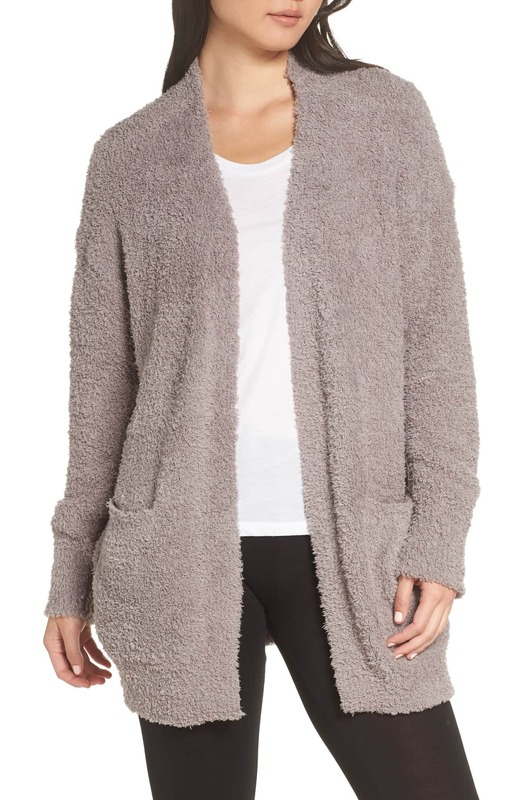 See it: Scoop up the Barefoot Dreams CozyChic Cardigan (marked down 50 percent off its original $134, now $67) while sizes are still in stock. Shop all CozyChic cardigans here. For anyone who has fallen in love with this topper but wants it in more color options, the Shop With Us team spotted another Barefoot Dreams cardigan that is quite similar. See it: Snag the Barefoot Dreams Bamboo Chic Lite Circle Lounge Cardigan for $116 while it is available in select sizes. 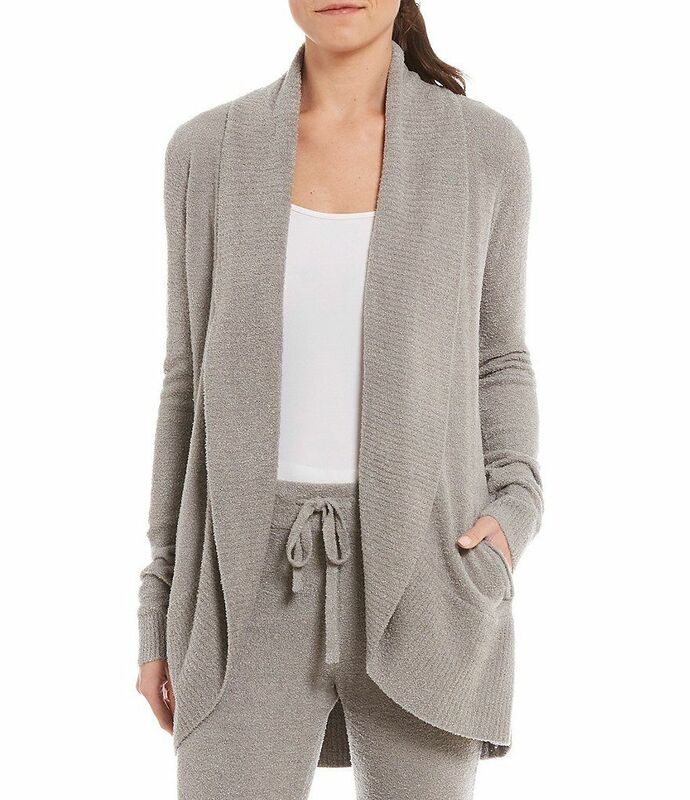 Like the CozyChic cardigan, this Bamboo Chic style has stretchy fabric, a longline design with an open front and practical pockets. It is available in two neutral color options: black (above) and pewter. Sizes range from medium to extra large. Check out how pretty the pewter option looks down below. Shoppers who bought this cardigan in black or pewter loved how the fabric feels but also liked that it it falls just below the hips and can be worn with leggings. We will totally be wearing these fuzzy cardigans with their matching lounge pants also made by the Barefoot Dreams brand! The look is effortless yet will allow Us to pull off a cool monochrome moment that is perfect for wearing around the house or stepping out to run errands if we see fit. It can easily be worn with low-top sneakers or our favorite Ugg shearling bow slippers. See it: Snag the Barefoot Dreams CozyChic Cardigan (marked down 50 percent off its original $134, now $67). Sold out of your size? Shop all CozyChic cardigans here. For an alternate style, grab the Barefoot Dreams Bamboo Chic Lite Circle Lounge Cardigan for $116 while it is available in select sizes.